My practice provides a confidential, safe and impartial space where you can talk to a qualified and Experienced Psycotherapeutic Counsellor about the difficult emotional issues that may be stopping you from getting the most out of your life at the moment. Counsellors help people to explore feelings and emotions that are often related to their experiences. This allows their clients to reflect on what is happening to them and consider alternative ways of doing things. Working in a confidential setting, counsellors listen attentively to their clients and offer them the time, empathy and respect they need to express their feelings and perhaps understand themselves from a different perspective. The aim is to reduce their confusion and enable them to cope with challenges or to make positive changes in their life where necessary. 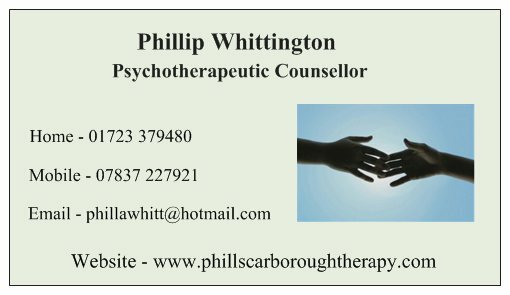 Should you wish to understand a little more about how I work as a therapist or supervisor, or indeed what counselling is all about please contact me to arrange a free 30 minute consultation that may help you to decide whether counselling is suitable for your needs at the moment. Where we go from there is entirely your choice, and you are not in any way obliged to continue with the work if you feel that it is not suitable for you. This is by no means a definitive list as I feel it's sometimes difficult to identify or label our feelings.